Heat approximately 1 tablespoon of vegetable oil in a large skillet over medium heat. Add the onions and cook until they become translucent, about 3-5 minutes. Add the spinach leaves and continue cooking and stirring until they start to wilt. Add the corn and continue cooking until heated through. Set this spinach-corn mixture aside. 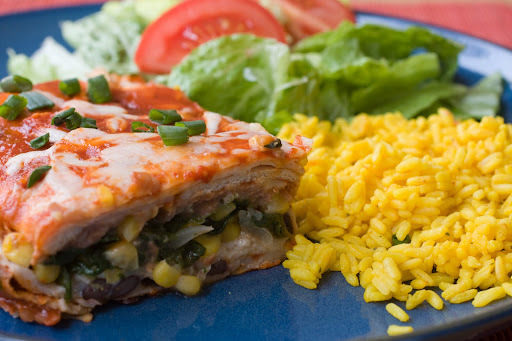 Spread one-third of the enchilada sauce over the bottom of a 9 x 13-inch baking dish and top with one-third of the tortillas. Layer with the refried beans, the black beans and half of the remaining enchilada sauce. Top with one-third of the cheese. Next, layer with half of the remaining tortillas, all of the spinach-corn mixture and half of the remaining cheese. Top with the remaining tortillas, the remaining enchilada sauce and the remaining cheese. Bake in the oven for about 30 minutes, until the sauce starts bubbling and the cheese has melted. Garnish with the green onions before serving. This pasta al pesto (approximately two servings), is really simple to make, especially if you use pre-made basil pesto from your grocery store. Cook approximately 12 ounces of pasta (really, any kind will do) in a large pot of boiling water. While the pasta is cooking, heat approximately one tablespoon of extra virgin olive oil in a large skillet over medium heat. Dredge the Gardein chick'n filets (from one package containing 4 filets) in some flour and cook in the skillet, approximately 4 minutes per side. Remove the filets from the skillet and cut them into bite-size strips. Add the pre-made basil (7 ounce container) to the skillet and heat through. Add the chick'n strips. 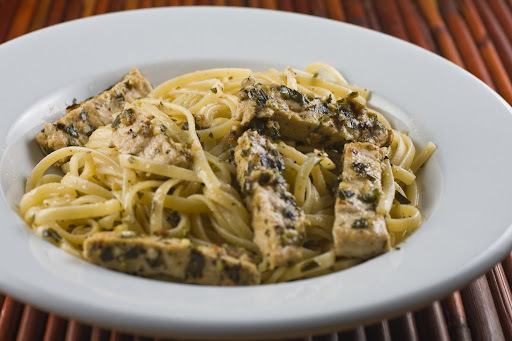 Reduce heat enough to keep the pesto and chick'n strips warm while the pasta is still cooking. Add the cooked pasta to the skillet, toss, and serve. A few weeks ago, I had the vegetarian black bean soup at the Au Bon Pain near where I work. 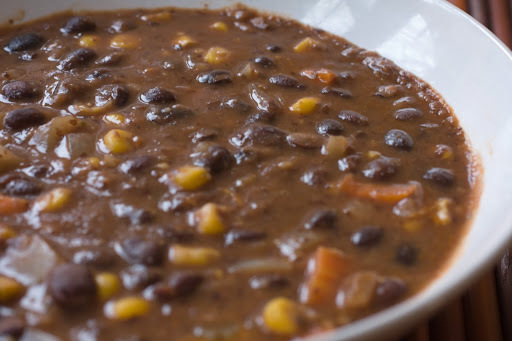 I found a similarly good recipe for vegan black bean soup posted by YCHRISTINE at allrecipes.com. 4 oz chevre or goat cheese. Preheat oven to 400 degrees. Coat an 8-inch square pan or (in my case) a 7 x 11-inch baking dish with oil. Cook kale in a large pot of boiling water for about 2 minutes. Drain and rinse under cold water. (To save time, you could remove the leaves using tongs and cook the noodles in this water.) Using your hands, wring out the water, chop the leaves, and them aside. Using a fork, thoroughly mash the ricotta and chevre together in a bowl and set it aside. Heat 1 tsp of olive oil in a saucepan over medium heat. Add garlic and red pepper flakes and cook for about 1 minute. Stir in the tomato puree, the Italian seasoning, and salt and pepper, to taste, and simmer for about 5 minutes. Spread 1/4 cup of the sauce on the bottom of the baking dish. Place 1/3 of the cooked lasagna noodles on top of the sauce. Top with half of the cheese mixture, half of the kale, and 1/3 of the remaining sauce. 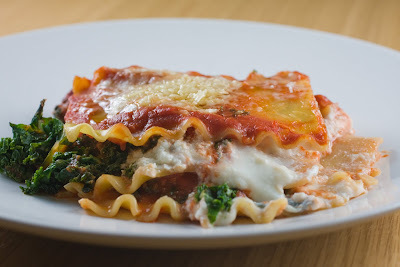 Add another layer of noodles and repeat with the remainder of the cheese and kale, and 1/2 of the remaining sauce. Add the third layer of noodles and cover with the remainder of the sauce. Sprinkle the top with the Parmesan cheese and bake uncovered in the oven for about 15-20 minutes, until the cheese has melted. Place the shiitake mushrooms in a small bowl. Pour the cup of boiling water over the mushrooms and let stand for about 5 minutes. Drain the mushrooms, reserving the water, and set them aside. Stir the cornflour into the reserved water and set that aside. Place all of the sauce ingredients in a small bowl and stir to combine. Heat the oil over medium heat in a large skillet. Add the mushroom, green pepper, chilli, and garlic to the skillet and cook until the garlic becomes soft, about 3 minutes. Stir in the sauce mixture. Next, stir in the reserved water (with cornstarch). Continue cooking until the sauce thickens and becomes bubbly. Add the tofu cubes and stir until they are warmed through. Serve with rice. This dish is easy to prepare and makes a great side dish for an Asian entree. Cut the cucumbers lengthwise into quarters and then into 1 to 2-inch pieces. Place the cucumbers in a colander, toss them in some salt, and let stand for about 20-30 minutes. Thoroughly rinse the cucumbers under cold tap water and pat dry with a towel. Place the cucumbers and carrots in a bowl. Heat the sesame oil in a small skillet over medium heat. Add the pepper flakes and cook until they start to deepen in color. Take the skillet off the heat and let cool to room temperature. Combine the vinegar and sugar in a small bowl. Pour this mixture over the cucumbers and carrots and toss. 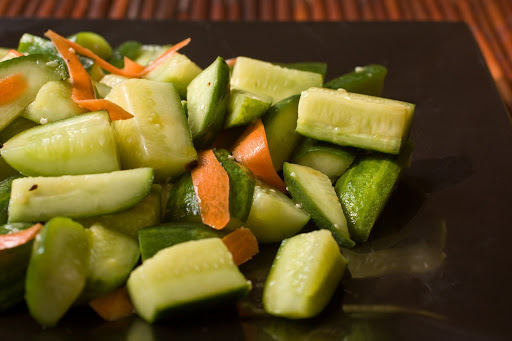 Add the chili-infused oil to the bowl of cucumbers and carrots and toss. Let stand for about 1 hour, until cooled. Sprinkle with sesame seeds before serving. 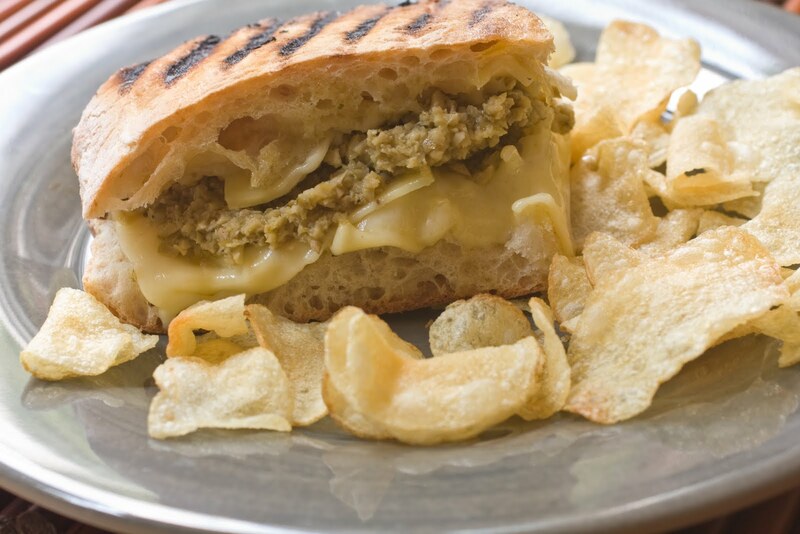 This recipe for grilled gruyere with green-olive tapenade comes from an old issue of Metropolitan Home magazine. It was included in an article entitled "The Great American Sandwich." 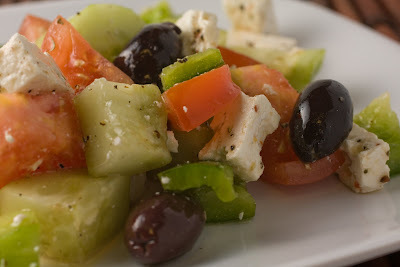 The article, including recipe, can be found here. I made this sandwich last weekend. I pretty much followed the recipe as written. I did find, though, that melting the gruyere just on the grill took much longer than the time specified. As a result, I ended up burning the ciabatta rolls. I solved this problem by lightly melting the cheese on the top and bottom half of each roll in the microwave for about 20-30 seconds, assembling the sandwiches as shown in the photo above, and then grilling the sandwiches for 2-3 minutes per side. Combine all of the tapenade ingredients in a food processor and pulse a few times until the mixture becomes spreadable, but not smooth. Add 1 slice of cheese to the bottom half of each ciabatta roll. Add 2 slices of cheese to each top half. Place each top and bottom face-up in the microwave and heat for 20-30 seconds, until the cheese begins to melt. Assemble the sandwiches by layering approximately 2 tablespoons of the green-olive tapenade between the top and bottom half of each roll, as shown in the photo above. Place the sandwiches on a hot grill, weighing them down with another heavy skillet. Grill for about 2-3 minutes on each side until heated through, and serve. The following recipe (slightly modified) comes from an old issue of Metropolitan Home Magazine. The recipe, as printed in Met Home, can still be found online. I've been wanting to try this recipe for the longest time. 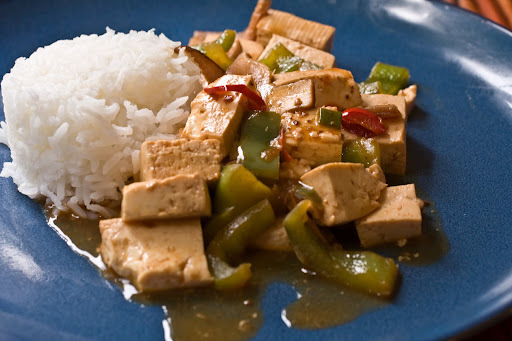 What I loved about this dish was that it was ridiculously simple and fairly inexpensive to make. And it tasted really, really delicious! I already had all of the ingredients in my pantry, except the mascarpone. This dish only took about 25 minutes to prepare, which, for me, makes it an ideal weekday meal . The following recipe will serve three using 8 1/2-inch by 5-inch gratin dishes. Place rack in middle of the oven and preheat to 450 degrees. Place the frozen spinach in a bowl and cover with very warm tap water. Replace water at least once to thoroughly thaw out. Heat the oil in a large skillet over medium heat. Add the onions and cook until they become soft, about 5 minutes. Add the chopped tomatoes with their juices and cook uncovered for about 10 minutes. Divide the tomato sauce among three gratin dishes. Using a spoon, make two indentations in the sauce in each dish and crack and an egg into each indentation. Season with salt and pepper. Remove the spinach from the bowl and squeeze out the water. 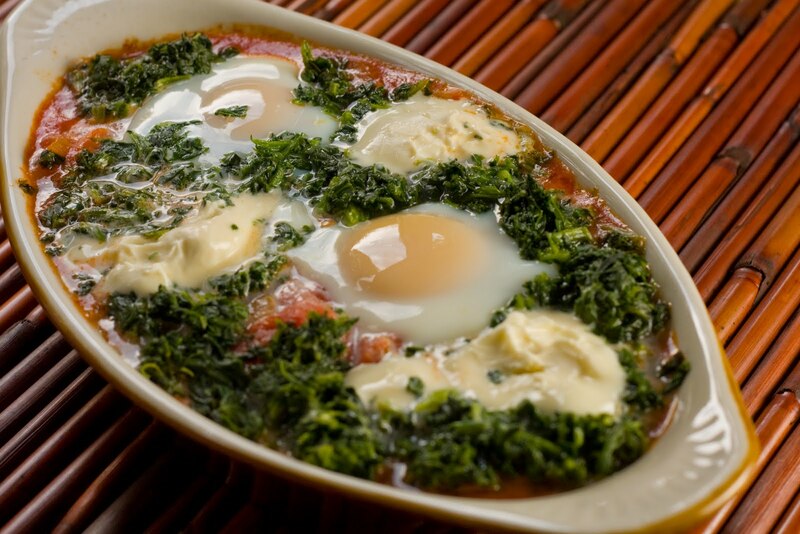 Scatter the spinach leaves around the eggs in each dish. Place the dishes in the oven. Bake the eggs until the whites are set but the yolks are still runny, about 10 minutes. Remove the gratin dishes from the oven, spoon dollops of mascarpone cheese around the eggs and spinach and serve with slices of baguette. The weather was so hot outside last Sunday that I really wanted something light and simple. The solution was found in a cookbook I received two year ago for Christmas from my sister entitled, "A Year in a Vegetarian Kitchen," by Jack Bishop. I grabbed the book and just started flipping through it when I came across a recipe for Southwestern Bean Bakes. In a nutshell, these were easy to make. They also tasted surprisingly very flavorful, given the minimal number of ingredients required. 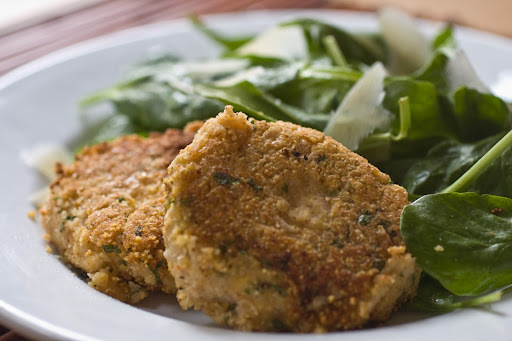 At the author's suggestion, I served these bean cakes alongside a simple baby spinach salad lightly dressed with olive oil, lemon juice and kosher salt. Add the cannellini beans, vegetable broth, and lime juice in a large bowl. Mash the beans using a potato masher. Next, stir in the cilantro, pepper, and chili powder. Add salt and pepper to taste. Stir in 1/4 cup of cornmeal. Continue stirring in more cornmeal in small amounts until you can form the mixture into 3-inch cakes. Heat 1 tablespoon of the oil in a pan over medium heat. Add the bean cakes and cook until browned, approximately 4 minutes per side. (Add more oil to the pan if necessary.) Serve immediately. In a small saucepan, bring 3 1/4 cups of water to a boil. 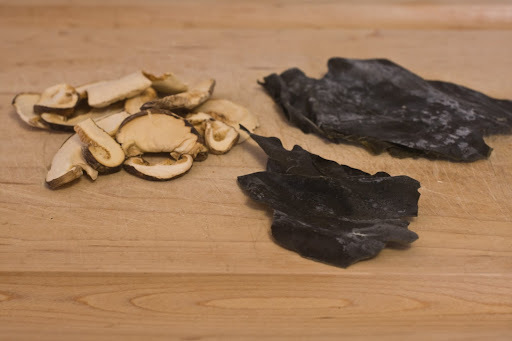 Remove the pot from the heat, add the kombu and dried mushroom (see photo below) and set aside for 10-15 minutes. Add the soy sauce and mirin to the pot and bring to a simmer. Continue cooking on low heat to boil off the alcohol (in the mirin). Remove the pot from the heat, strain the liquid into another container (e.g., a large pyrex measuring cup), and discard the kelp and mushrooms. Set aside until it is cool enough to be placed in the refrigerator, and chill. Cook the somen noodles according the directions on the package. Somen noodles cook very fast in boiling water, from 3-5 minutes, so be sure to keep a close eye on them. Drain and rise the somen noodles thoroughly in cold tap water. 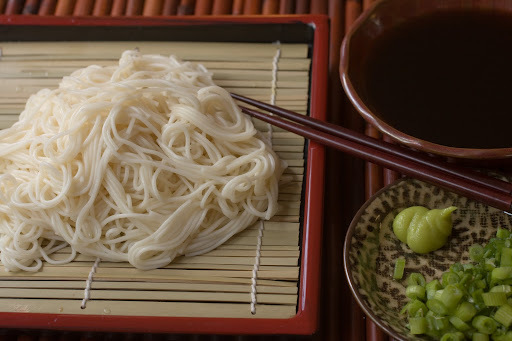 Place the somen noodles on individual plates. Serve with a small bowl of the chilled dipping sauce and a small plate of scallions and wasabi paste. When ready to eat, add the scallions and stir in some of the wasabi paste into the dipping sauce and enjoy! The cover of the latest issue of Vegetarian Times magazine promised "32 fresh & easy recipes under 350 calories." 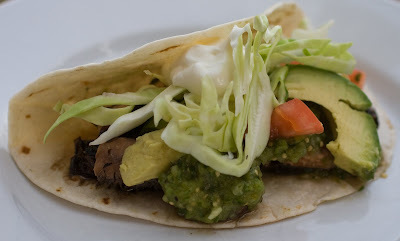 On Sunday, I chose to make the portobello tacos that were featured in the magazine, mainly because the ingredients were inexpensive. Also, I wanted to make a meal that didn't have to be served piping hot, because the weather outside was very warm that day. Note: although the VT recipe calls for 6 6-inch corn tortillas, I found that the recipe, as written, will make more than 10 tacos. I used 5 portobello mushroom caps and was able to assemble 11 tacos. Lastly, I served these tacos with yellow rice. Preheat your grill or grill pan to high heat. For the salsa verde, combine all of the ingredients in a food processor and pulse until smooth. Next, whisk together 1/3 cup of canola oil and the balsamic vinegar. Brush this marinade over the portobello caps. Set the caps on the grill and cook for about 3-5 minutes per side until they soften slightly. Remove the caps from the grill and set them aside. The caps will continue to cook. When the caps become cool enough to handle, slice them into strips. To assemble the tacos, lightly warm the tortillas on a grill for about 15 seconds per side. Fill each tortilla with the sliced mushrooms (approximately 2 slices), avocado (approximately 1 slice), salsa verde, cabbage, tomatoes, and a dollop of sour cream. Add the first three ingredients to a medium saucepan and bring to a boil. Add the rice and reduce to heat to low. Continue cooking the rice until it has absorbed most of the liquid but is still al dente, about 10-15 minutes. 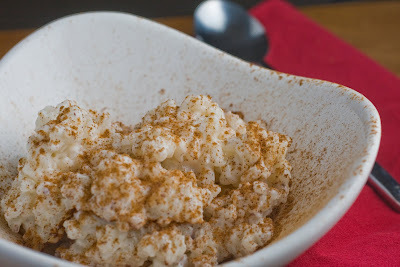 In another saucepan, bring the milk, sugar, vanilla and a couple of dashes of cinnamon to a simmer. Add the cooked rice. Continue cooking the rice over low-medium heat until it has absorbed most of the milk and the mixture starts to thicken and become creamy, about 10-15 minutes. Pour the contents of the saucepan in a large bowl or baking dish. Cool to room temperature. Sprinkle a generous amount of cinnamon over the top. Cover and place in the refrigerator and chill for at least three hours. Serve with whipped cream. 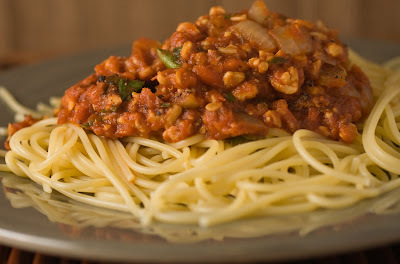 Recently, though, I came across this Vegetarian Times recipe for a tempeh bolognese. Admittedly, I prefer the taste of Giada DeLaurentis' vegetable bolognese over the tempeh bolognese. However, the tempeh bolognese is especially good if you want something that is seriously protein-packed. Heat the oil in a large saucepan over medium heat. Add the crumbled tempeh and cook until lightly browned, about 5 minutes. Add the onions, garlic, carrots, dried herbs, salt, and pepper. Cover and cook for about five minutes, stirring frequently. Add the tomato paste and broth/wine. Continue cooking for another five minutes, stirring frequently. Add the crushed tomatoes. Simmer over low-medium heat for about 20 minutes. Stir in the fresh parsley and basil, and serve over pasta. Making split pea soup can be time consuming. Normally, you would be required to either soak the split peas overnight or cook the split peas for about 1 1/2 to 3 hours before pureeing them in a blender. A pressure cooker, on the other hand, absolutely pulverizes the living $&%# out of dried split peas in about 12-15 minutes. No soaking required. No blender required. 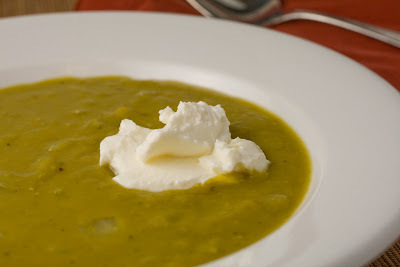 With a pressure cooker, you can make split pea soup for dinner on a weekday after coming home from work and not have to serve it at 9 p.m.
Heat the oil in the pot over medium heat. Add the next five ingredients listed above. Stir, cover, lock the lid in place, and increase the heat until high pressure has been attained. Lower the heat enough (usually low-medium) to maintain that pressure for an additional 15 minutes. After 15 minutes has elapsed, turn off the heat and let the pressure begin to fall naturally. (If you have an electric stove, as I do, take the pot off the hot burner.) After 10 minutes has elapsed, open the valve to release any remaining pressure, if necessary. If the consistency of the soup is too thick, thin it out with some water or additional vegetable broth. Stir in the thyme and salt. Serve with a dollop of sour cream.